Seven people have been injured after a rocket fired from the Gaza Strip hit a house in central Israel, police say. The rocket came down at 05:25 local time (03:25 GMT) in Mishmeret, 20km (12 miles) north of the city of Tel Aviv. This is the furthest a Palestinian rocket has reached in Israel since the 2014 conflict with militants in Gaza. Israeli Prime Minister Benjamin Netanyahu, who is cutting short a trip to the US over the incident, has vowed to respond with force. So far no-one has said they carried out the attack. But an Israeli military spokeswoman has accused the militant group Hamas, which controls Gaza. A week and a half ago, two rockets were launched towards Tel Aviv and nobody was hurt. The Israeli military responded with dozens of air strikes across Gaza, which injured four people. Hamas and Israeli officials later said those rockets had been fired “by mistake”. 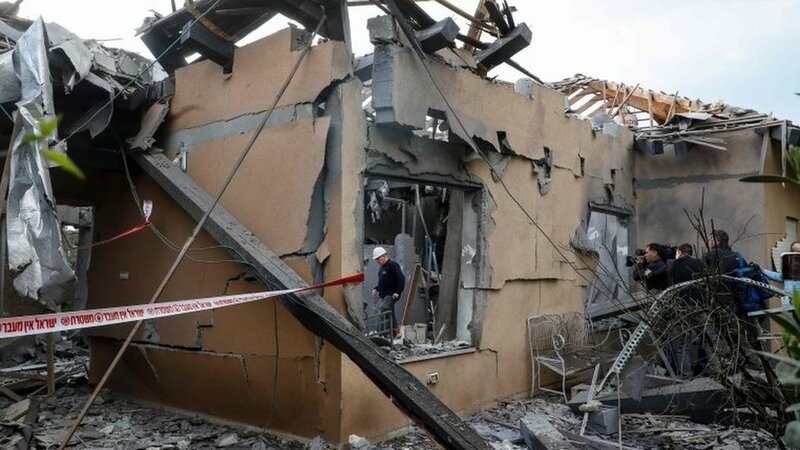 The Israel Defense Forces (IDF) said the rocket that hit the house in Mishmeret was launched from Rafah in southern Gaza, about 120km (75 miles) away. Israel’s Magen David Adom ambulance service said it had treated two women who were moderately wounded and five other people, including an infant, a three-year-old boy and a 12-year-old girl, who had minor wounds. The blast also caused damage to at least one nearby home and several vehicles. “We heard the siren and we didn’t think it was anything, but my daughter made us go into the reinforced room,” Smadar Castelnovo, who lives opposite the house that was hit by the rocket, told Reuters news agency. Although the rocket triggered sirens in the Sharon and Emek Hefer regions, Israel’s Iron Dome missile defence system did not appear to have been activated. Who was behind the attack? IDF spokeswoman Major Mika Lifshitz blamed Hamas. “We see Hamas as responsible for all that happens in the Gaza Strip,” she added. Maj Lifshitz said the IDF was deploying two additional brigades to the area surrounding Gaza, and that there was a “very limited” calling up of reservists. The Israeli authorities have also closed the Kerem Shalom and Erez border crossings with Gaza. Hamas has so far not commented, but its leader Yehiya Sinwar reportedly cancelled a public meeting scheduled for Monday afternoon. The timing of this rocket launch comes at a very sensitive time. The Israeli prime minister is fighting a close election campaign in which he is brandishing his security credentials. He had just arrived in Washington, where he was due to meet President Trump twice and give a speech. He will now go once to the White House and then says he will return home “to manage our actions from close at hand”. Already fears of an escalation were high with this week’s anniversary of the start of protests at Gaza’s boundary fence with Israel. Egyptian security officials – who’ve been trying to broker a longer-term ceasefire between Israel and Hamas – were due in Gaza this morning. Now, their efforts to bring quiet are in jeopardy.